Dr. Clayton Bangsund (PhD) joined the College of Law in 2014. He is an expert in secured finance and various other fields of commercial law. 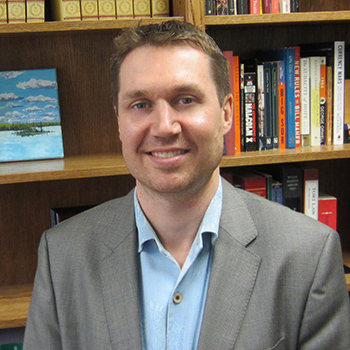 After graduating with distinction from the Faculty of Law at the University of Alberta, Clayton practiced law in three western Canadian provinces: Alberta, Saskatchewan and Manitoba. He gained expertise in a variety of corporate and commercial practice areas, and developed a special focus on debtor-creditor law – both front-end lending and back-end realization. While engaged in private practice, Clayton penned numerous articles and newsletters, and wrote bar course (CPLED) materials for the Law Societies of Alberta and Saskatchewan. Following six years of practice, he embarked on an academic path. Clayton earned a Master of Laws from Columbia Law School where he was recognized as a James Kent Scholar and awarded the Walter Gellhorn Prize for graduating with the highest grade-point average in his class. He then returned to the University of Alberta to pursue a Doctor of Philosophy under the supervision of Professor Roderick J. Wood. As a doctoral student, Clayton was recognized as a Vanier Scholar (SSHRC) and received numerous other scholarships and prizes in support of his research including the Viscount Bennett Scholarship and the President’s Doctoral Prize of Distinction. Clayton is the founder and editor of JuliusErwin.com, an online magazine that serves as a venue for reasoned analysis of law and policy. He is also a member of the Canadian Conference on Personal Property Security Law (CCPPSL) and the working group which has been tasked by the CCPPSL with reviewing the Canadian PPSAs and setting forth proposals for change. His teaching responsibilities with the College of Law include Contracts, Commercial Relationships, Secured Transactions in Personal Property, and Banking, Payment & Transfer Systems. In 2016, he was awarded the University of Saskatchewan Students’ Union Teaching Excellence Award. “ABCD Remoteness Problems: Nemo Dat & Its Exceptions Under Subsection 26(1.2) of Saskatchewan’s The Sale of Goods Act” (2018) 81(2) Saskatchewan Law Review 133-161. “Proposals for Changes to the Canadian Personal Property Security Acts” (2017) 59(2) Canadian Business Law Journal 145-242, with Ronald C.C. Cuming, Tamara Buckwold, Anthony Duggan, Catherine Walsh & Roderick J. Wood. “Deposit Account Set-Off Under the PPSA” (2017) 80(1) Saskatchewan Law Review 11-35: commemorative edition celebrating Professor RCC Cuming’s 50 years of excellence at the College of Law. “Set-Off & Security Interests” (2017) 50(1) University of British Columbia Law Review 1-37. “Reconciliation in the Corporate Commercial Classroom” (2016-17) 2(1) Lakehead Law Journal 49-63, with Anna Lund, Gail Henderson, Freya Kodar, Carol Liao & Shanthi Senthe. “Inequity in Equitable Set-Off: Telford v Holt Revisited” (2016) 94(1) Canadian Bar Review 149-170, with Jasmine Lothian. “PPSL Values” (2015) 57(2) Canadian Business Law Journal 184-216. “The Deposit Account & Chose in Action at Common Law & Under the PPSA: A Historical Review” (2014) 30(1) Banking & Finance Law Review 1-38. “‘But I Didn’t Mean To’: The Role of Intent in American and Canadian Anti-Preference Law” (2013) 50(4) Alberta Law Review 815-842. “A Critical Examination of Recently Proposed Amendments to the Bank Act Security Provisions” (2012) 75(2) Saskatchewan Law Review 211-243.